The progress of the earth sciences and the advancement of technologies associated with the understanding of our planet during the 1940's and 50's have led geologists to develop a new way of looking at the world and how it works. This exhibit explains the history of our new understanding of the Earth and provides a brief overview of the theories behind it. All animations built from maps used with the permission of C.R. Scotese, PALEOMAP Project. The Paleomap project at the University of Texas at Arlington. Paleogeography Through Geologic Time by Ron Blakey at Northern Arizona University. Finally, it seems appropriate to mention the Alfred Wegener Institute, the German national research center for polar and marine research, carrying on Wegener's tradition of interdisciplinary earth science. S. Uyeda. 1978. The New View of the Earth. W.H. Freeman and Co.
W.K. Hamblin. 1975. The Earth's Dynamic Systems. Burgess Publishing Co.
P. Kearey, and J.V. Frederick. 1996. 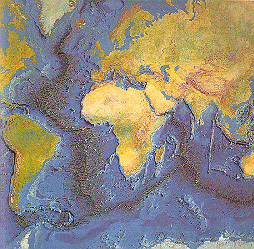 Global Tectonics. Blackwell Sciences Ltd.
C.W. Montgomery. 1987. Physical Geology. Wm. C. Brown Publishers.